BU’s Virtual Avebury project was in the news this week, on radio and online. The team are in the middle of a 3 month public engagement phase of the project at the Barn Gallery of the Alexander Keiller Museum at Avebury. 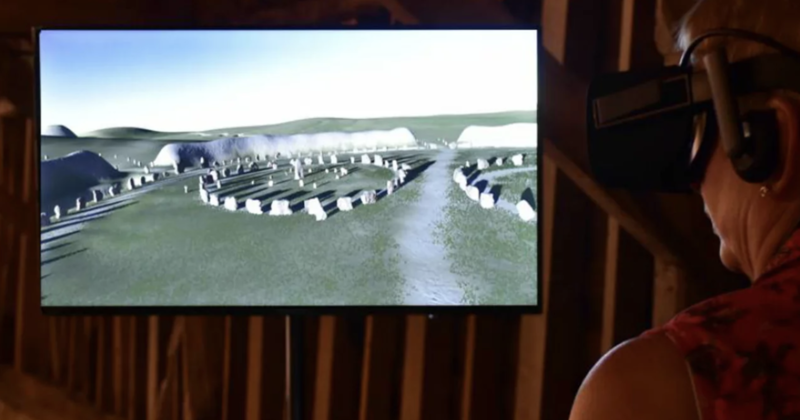 Since the beginning of June, more than 250 visitors have experienced a fully immersive, 3D simulation of how Avebury may have appeared around 2,300 BCE. BBC Wiltshire Radio came to interview the team this week and the broadcast can be heard here, at 46 minutes into the programme. Marlborough Online News also came to experience Virtual Avebury for themselves and their report is on their online news site. The National Trust have featured the project on their Avebury website too, with links to the dates we are at Avebury, so the team are hoping for as many visitors as possible to come and share the experience of Virtual Avebury. The project is funded by AHRC/EPSRC and is a partnership between BU, National Trust, Daden Limited and Satsymph.